If you or your children have been interested in learning more about aquatic animals and fish, the South Carolina Aquarium would make for a great family trip. The South Carolina Aquarium allows you to get up close and personal with many of the most exotic aquatic animals in the world. The South Carolina Aquarium will allow you to easily bring the entire family out for a morning or afternoon of fun and learning. 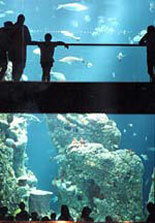 Once inside the South Carolina Aquarium, you will find yourself surrounded by the many fascinating exhibits. You can watch the Magellanic penguins swim, dive, and waddle their way around the aquarium. You can also meet our Albino Alligator, the South Carolina Aquarium's newest friend. You will have the chance to visit our many exhibits including The Great Hall, Mountain Forest, Piedmont, Coastal Plain, Salt Marsh Aviary, Coast, Ocean, the Touch Tank and others. You can also visit Camp Carolina, where you can explore an interactive campsite and meet some amazing critters. The mission of the South Carolina Aquarium is to "inspire conservation of the natural world by exhibiting and caring for animals, by excelling in education and research, and by providing an exceptional visitor experience." The Aquarium would like to invite you and your kids, along with their friends and relatives, to partake of this mission also. You too can become inspired to learn more about nature. As you walk through each of the many exhibits, you will be impressed by what Mother Nature has to offer. In the Great Hall, you will find two-story windows which offer one of the best views around of Charleston Harbor. A 15,000 gallon Carolina Seas exhibit allows guests to be entertained by some colorful fish found around the reefs off the coast of South Carolina. The Mountain Forest Aviary allows you to explore the wildlife of the Blue Ridge mountains. Spectacular waterfalls that drop through the rocky mountains will impress you, and in the water you will find some of the freshwater trout found in South Carolina. See for yourself how beautiful the backyards of South Carolina are. As you and your friends walk through the Coastal Plain exhibit, you will be witnesses of the wetland habitats of South Carolina. It is here where you will meet the South Carolina Aquarium's Albino Alligator. A brief tour of history is also realized, as we look at the consequences of Hurricane Hugo in 1989. It is in the Coastal Plain exhibit that you will find rattlesnakes, long nose gar and carnivorous plants. Next up on your stop at the South Carolina Aquarium is the Salt Marsh Aviary. It is here that you will find an immense 2,500-square-foot exhibit that displays views of the Charleston Harbor. Get up close and personal with the birds and marine life of South Carolina's Aviary. A must-do for you and the kids is to visit the South Carolina Aquarium's Touch Tank. Kids and adults love to see the marine life up close, but love to touch it even more! Here you will be able to rub your fingers along the hermit crabs, whelks, sea urchins, stingrays, and horseshoe crabs. There are always South Carolina Aquarium staff and volunteers on hand to teach you about the history of each species, so feel free to ask them any question. These are just a few of the exhibits you will be able to visit. The experience will not only be fun, but educational as well. We invite you and your family to visit us soon.